The title pretty much says it all. Minus the tomatoes. Today is the last of the grocery shopping from last week so its create something with leftovers time! These are good hot, but I am looking forward to just eating these on the go in the morning. 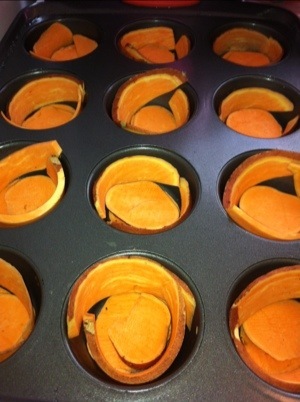 I started off just slicing the sweet potatoes long and short with a mandolin. The long slices I cut in half and wrapped those around the cupcake pans, the small round slices I put on the bottom of the cupcakes pan. Grate the zucchini and slice the cherry tomatoes. 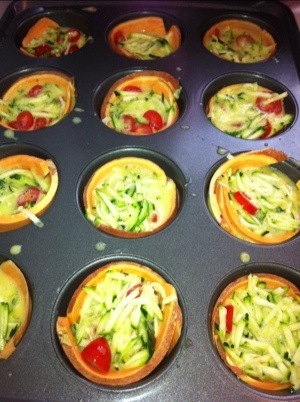 Then just mix together your eggs, zucchini, and tomatoes and spoon the mixture into the cups. Add a bit of salt and pepper to the mixture. I baked these for about 15 minutes at 350. 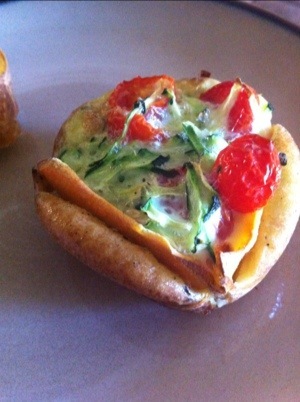 Posted by paleoyummers on September 3, 2012 in Breakfast, Sugar Detox approved!